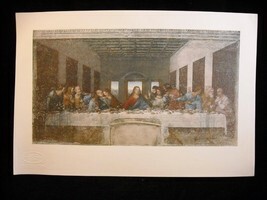 Thissale is for a print of Leonardo DaVinci's "The Last Supper". This print is stamped "RR Gallerie di Lombardia". Measuring 12.5 inches wide by 8.25 inches and is embossed with the printers logo which reads " Eliotipia Roberto Hoesch Milano Renascimento Prints".